It isn’t necessarily the case that only filthy homes encourage the likes of mice and rats to cause infestation to a home. In fact, any area of a property or the surrounding land or garden is susceptible if it provides food, warmth and shelter. 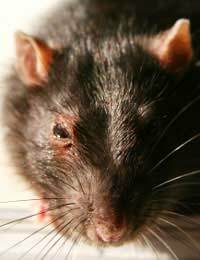 Rats need to be controlled as they can transmit disease to humans including Weil’s disease and Salmonella poisoning. In a house, they will take up residence under floorboards, in lofts, in wall cavities and in cellars. Although we mostly associate them with living in sewers, they can also survive in your garden, living in and beneath sheds and by burrowing into compost heaps. Basic housekeeping and cleanliness is your best defence against rat infestation. Ensure that your backyard or garden is well maintained with any overgrown areas cut back to restrict rats’ potential nesting sites. Also, remember that if you enjoy putting food out to attract the likes of birds, hedgehogs or squirrels, you’re also encouraging the likes of rats and mice, too. So, while not suggesting you stop providing food for other wildlife, make sure you don’t put food out to excess. Also, make sure that your household rubbish is disposed of properly and in a secure manner. It’s important that your house is kept in good repair to reduce the opportunity for rats to get inside from an external vantage point. Also, avoiding an Overgrown Garden will help to restrict areas where rodents can find shelter. If your home or gardens become infested with rats, contact your local authority’s environmental health department. They will send out a pest control officer to survey the scene, put down poison in appropriate locations, and make follow-up visits to ensure that the problem has been rectified. Mice are also fond of similar locations to rats when it comes to looking for food, warmth and shelter. Not all local authorities will offer a free service to get rid of mice infestation, so it may be down to you as the householder to deal with the problem yourself. You should do this quickly as mice can severely damage cables and insulation. Mouse poison and mouse traps offer the best solution and your local garden centre or hardware store will be able to offer you advice. So too will your environmental health department, even if they do not offer a service to remove them. However, if you have young children and/or pets, it’s important you seek proper advice before using any rodent poison or pesticides. While most of us will have some fear of bees and wasps, the important thing to remember is that, for the most part, both of these play an important role in the ecological balance of gardens. Therefore, if you come across a wasps or bees nest in your garden, providing it is not too close to where humans would come into contact with it, you should leave it alone. However, in certain situations where a nest is in close proximity to where people come and go, or if it has actually been built somewhere on the property itself, it may be necessary to have it removed. You can do this yourself providing you know what you’re doing and take adequate precautions and wear protective clothing. But it might be preferable to seek out the services of a pest control company. Alternatively, your local authority may offer you this service, although it’s more likely they’d charge you for it. If you suspect that your neighbours might be responsible for attracting creatures that can cause infestation, you should try to have a polite word with them. For example, if their house is badly maintained, they don’t take enough care in how they dispose of their rubbish or their gardens are overgrown, all of these things might encourage the likes of rats and mice to the area in which you live, even if your house isn’t the direct cause of the problem. If your neighbours fail to take remedial action and the problem persists, then you have every right to report this to your local authority. There are many other problems that can result in infestation. Pigeons, foxes, fleas, ants, cockroaches, squirrels and even bed bugs are just some of the issues that you could be faced with. If you have any problems that you’re not sure how to tackle, your local environmental health department alongside the likes of garden centres and hardware stores should be sufficient to provide you with all the advice you need. Neighbour has mattress’s stacked up fencing adjoining our house, these have been there for a number of years now but smells awful in summer months. Not seen any rats or so forth but that’s not to say that they aren’t there. My dog is always attracted to that side of the fence so we have to distract her away. I have a nightmare neighbour. She moved in 2 years ago.she plays loud music during the day, bangs inside and outside literally all night long, she litters and has a constant overflow of rubbish at all times. She appears outside in public seminaked and is harassing my family and myself in her car and has now installed a cctv camera which she directs across our property. We have reported all of these issues to the council, police, her housing association, Ico, and have made contact with local councillors. None will address this problem. She has a previous history of all of the things which we have been reporting, and still these bodies of authorities do nothing. She has now served us with an injunction, which we successfully had disqualified, but are now in the process ofcourt proceedings which she has submitted a claim for us harassing her. Wherever we go for help, the only person who gets any help is her? Omg can anyone help me. My neighbour has a non compost heap of clippings up to head height and has done the past near 7 yrs lived here. This summer I’ve had the worst infestation of things I know not of. I’ve been bitten itching have parasites and this bad bad smell from this heap very close to my window which I’ve stupidly had open thru summer. I’ve got to go to the hosp for infectious and tropical diseases as no one can help me. I’ve gotten rid of my mattress bedding soft furnishings the lot and haven’t managed to be there at all over the past few months. I have spores of things growing and thin black things in the bed in the morning and others like grains of salt that I can pick off of my body, these bites hurt like hell like being injected but I can’t find any help or hope of what to do. I’ve tried every treatment, I’ve binned all I can and these things are still present. With those super hot temperatures and a heap of crap mainly cuttings that grows and grows this is something so nasty that I just don’t know how to deal with. I have tried everything this is a seriously bad situation. I work in my local Asda and have done for several years, for the past 6-8 months at least there have been rats galore all over the warehouse chewing there way through stock that has been delivered that day. Us as employees are still expected to carry on work as normal pulling in pallets of stock from the infested area on to the shop floor to be put out for customers. Nearly every pallet pulled in has clear evidence of rats having chewed their way through packs of biscuits, cereals, sweets, basically anything that smells good. As we all know rats carry disease and not to mention the fact they urinate as they go and there is evidence of this on the stock we have to work. There are traps and pest control are apparently 'on It's but the situation is getting worse and it's a matter of time before they find there way onto the shop floor! I am concerned that I may catch something as I'm touching and moving boxes of stock that have clearly been rat damaged and management do not seem to be bothered. Myself and colleagues have had enough something needs to be done. I have been living next to a neighbour who hates cleaning and a result there is always a strong odour coming from her unit. It is sooo bad that we can't even sit on our balcony as the smell comes from her balcony. The smell lingers from outside our front door and then lingers from her balcony onto ours. Yesterday I opened my front door and the carpet outside the offending unit was covered in 100s of maggots, and some found outside our door. I have brought this to the attention of our body corporate, but the person responsible is the chairperson and has friends on the committee. I have put up with the smell for 13 years, spending countless amountsof money on air freshers, glen20 and fly spray. I really need some help as to what action can be taken.I am an owner of the unit and the offending neighbour also owns her unit. You should report this to your environmental health department. I have been living next to a neighbour who hates cleaning and a result there is always a strong odour coming from her unit. It is sooo bad that we can't even sit on our balcony as the smell comes from her balcony. The smell lingers from outside our front door and then lingers from her balcony onto ours. Yesterday i opened my front door and the carpet outside the offending unit was covered in 100s of maggots, and some found outside our door.I have brought this to the attention of our body corporate, but the person responsible is the chairperson and has friends on the committee. I have put up with the smell for 13 years, spending countless amountsof money on air freshers, glen20 and fly spray. I really need some help as to what action can be taken. I am an owner of the unit and the offending neighbour also owns her unit. Phone your local environmental health department. They should be able to make attempts to trace the owner and serve a notice to force them to clean up. i live in a housing association house, i have a private house next door and another housing association house on the other side of that, the housing association have allowed the tenant on the other side of the private house to keep chickens, and two years ago i made them aware of a rat infestation, the private house next door to me has also now got chickens, i pointed out to her that this would bring more rats and was told well we already have them so it wont make any difference, however it has, i have a cat that usualy brings home one or two rats a week that he has caught and killed, however he is now bringing home one or two aday,i have called my housing association to inform them of the growing problem and was told that they dont deal with rats, i pointed out to them that as they have allowed tenants to keep chickens then i consider them responsible for the growing problem, i have seen rats running around during daylight hours at the front of the property's on several occasions and am aware that this can mean a serious infestation, i have advised the lady next door that she needs to do something to control the problem however this has fallen on deaf ears, i have also informed the local housing authority who have offered to lay traps in my garden for a fee, i pointed out to them that i have a cat that loves to hunt and have not had any sightings in my garden and i feel that as this problem is due to chickens being kept by other home owners and tenants it should be down to them and the housing association to foot the bill for any traps/bait that needs to be applied is there anything else i can do to ensure that this infestation is dealt with? My neighbour has all kinds of rubbish pile up along 2 fence panels in their garden, garden rubbis, old kitchen bags of cement, carpets etc. Will this ba a place where rats would be nesting? We have recently seen a rat in our garden and think it may have come under the fence. What can we do? Our neighbours don't speak to us, and never have in the 18months we have lived here, we did try when we first came and were ignored. My sister has recently had an infestation of rats in her garden. She lives in adetached property, 3 miles out of town, near no one. There has been no damage and she suspects that they were brought there as overnight 12 turned into 200 and so on. A vegan an refusing to use poisons as her garden is organic and home to masses of wildlife, she responded to a complain from the council, assuring them that given time, and food withdrawal from bird tables, numbers would decrease, which they have now to only 15. However, she is still being pressured by the council and getting a follow-up call out in January.As owner and strongly against cruelty to ALL species, I think she has a right to continue with he methods until all rats have gone Does he have a case?I must add she has NO rats in her house ad there has ben no damage. I live in a condo. My neighbor has been feeding the birds for over 8 years and the HOA has done nothing.There is a manifestation of rats in my walls.It has cost me money , time , and sleepless nights.I'm so concern for my health and the health of the neighbors.I have called the Contra Costa Mosquito and Vector company.All sorts of board meetings , a petition . Do you have any suggestions!Thank you! The council will do it but most councils charge a fee. i know how you feel. but its a lot worse for my sisters. my sisters are autistic and we always get things thrown into the garden and over us. because my sisters different. and people don't like it. last time i reported the problem i had my finger cut. so i don't know what to do anymore. We don't offer this service. Your local council's environnmental health services may have a list of pest control services/prices. Hi I bought a second hand sofa a couple of months ago!! I started noticing a funny smell in the living room!! The smell was getting stronger and smells like weed!! I pulled all the sofa apar ( it's a corner sofa) and found green mold underneath all over the carpet ?? I was horrified I cleaned it bleached it you name it!! But it keeps coming back does anyone know what on earth this could be??? Have you tried completely drying it out (a fan heater, hair dryer or dehumidifier might work)? Is the room damp at all? That could be making it worse. Myself and my family lives downstairs in a block of flat in Northolt owned by Freshwater group of companies. We have a communal garden which is adjacent to another road. However, our communal garden has been recently taken over by group of foxes; numbering about 10. They used to come out around 11pm before but now visible in the communal garden around6pm. This is very disturbing considering the fact that we have children playing around the block, and even more concerning as we can not open our back window for the fear that they might jump into our flat. I am confused, can anybody advise me on what to do? I'm not sure whether to call environmental health to help.I live in a block of flats owned by merlin housing. On Sunday we noticed maggots in the communal hallway area over the drain from the concrete cracks by the front and back door. The bins outside are infested with maggots all along the garden. It's also a communal garden. All 3 downstairs residents keep our homes tidy and clean and the last thing we expect when exiting our home is to be swamped by maggots. When ringing merlin on Sunday we got told that it wasn't an emergency. To just put down salt as salt kills them. We did but that only killed the maggots visible and hasn't stopped the problem. So we now have problem number 2 salt coming in to the property bring dragged in by our feet and slipping on salt when walking on the communal area. Merlin came round today Tuesday To say the maggots aren't coming from the drains and someone must of brought a bag that leaked through. They didn't clean or deal with the problem so what can we do? As it's not pleasant having maggots just upside your door trying to get into your home! So we can't even open our windows just in case.